Here we feature a group of Canadian stations that may look familiar (except perhaps for VE9AI) . At the top is a 1937 card from old standby CFCX, on 6005 even back then. To the right is CHNX when it still sported its "experimental" SW call, VE9HX. This one is from 1935. Under CFCX is a 1939 card from CJCX, a regular which many of us can remember on 6010 until its demise not too many years ago. VONH from Newfoundland is an interesting one. 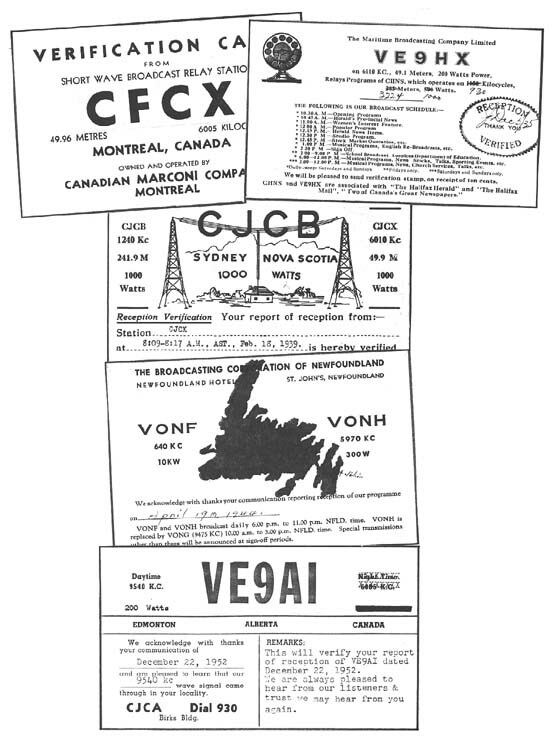 The Broadcasting Corporation of Newfoundland eventually merged with the CBC, and VONH became CBNX, then today's CKZN-6160. VE9AI relayed CJCA in Edmonton, Alberta, and its 200 watts was widely reported on 9540.